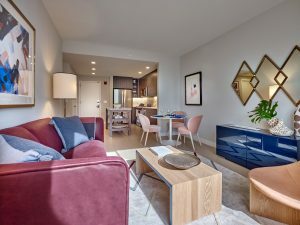 At Quinn, we are in the unique position to offer three-bedroom residences, which are some of the only new construction three bedrooms in all of Paulus Hook. With interiors designed by Fogarty Finger, the spaces are infused with luxurious features and finishes that contribute to ease of living. 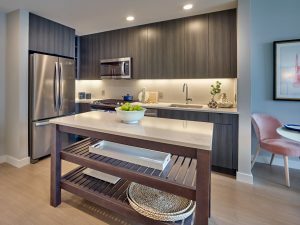 Spacious living areas feature designer flooring, and kitchens are equipped with stainless steel appliances and fixtures, quartz countertops and sleek, modern cabinetry. Every apartment features a washer and dryer and under cabinet lighting. 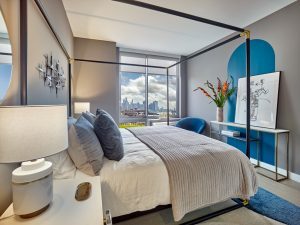 Select residences feature pendant lighting, walk-in closets, and private terraces. To tour one of our three bedroom residences, call our leasing team today!